Comment courtesy of OldLutonian on the Guardian. 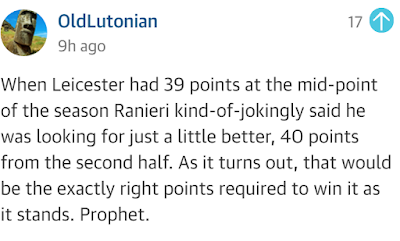 "When Leicester had 39 points at the mid-point of the season Ranieri kind-of-jokingly said he was looking for just a little better, 40 points from the second half. As it turns out, that would be the exactly right points required to win it as it stands. Prophet." Have people spoken too soon? Or is the rest history? All eyes turn to Old Trafford then, where the odds, at least according to the bookmakers, favour Manchester United.